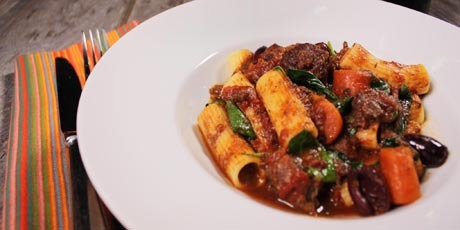 A warm, easy dish of penna pasta, beef shanks and a hearty mix of vegetables and herbs. 1. Splash the olive oil into a pressure cooker over medium-high heat, sear the beef shanks until brown and crispy on both sides, about 4 minutes each. Remove the shanks to rest on a plate. 2. Splash a bit more olive oil in the pan, add the onions, stirring and cooking to brown, about 5 minutes. Stir in the garlic and carrots. Add the red wine then the tomatoes, breaking them up with your fingers. Toss in the bay leaf, oregano and salt. Bring the works to a full boil then reduce the heat to medium. Fit the lid on the pot, forming a tight seal. Cook allowing the intense internal pressure to dramatically speed up tenderness, about 5 minutes. Then allow the cooking to continue at full steam for about 15 minutes. 3. Remove the cooker from the heat and allow the steam to die down completely before carefully remove the lid. Remove the bones from the shanks, and add the olives, spinach and cooked penne. Dinner is ready, serve and share! 4. For more information, detailed use instructions and safety features consult the manual that comes with your pressure cooker or search for it online.